Once in a while, we need to get away from work-related stress. While we yearn for a lengthy holiday break in some far destination, most of the time we need to spend our weekends wisely in order to recharge our batteries for more rigorous work ahead. Today, you can retreat to a mountain-resort type of haven that is less than two hours of leisurely drive from Makati City’s Central Business District — the Tagaytay Highlands. Fitting the description of a home away from home, the Tagaytay Highlands is a one-of-a-kind property that sprawls across Tagaytay’s scenic mountain ridges. Covering a land area of approximately 1,200 hectares, it is also the only mountain resort of its kind and scale with lands covering three provinces — Cavite, Laguna, and Batangas. At 2,000 feet above sea level, it offers panoramic views of Taal Lake and Volcano, the mystic Mt. Makiling, the Canlubang Valley and the Laguna de Bay. Among the advantages of its elevation is the cool and breezy weather all throughout the year, with an average daily temperature of 22°C. Its location and proximity to Metro Manila also make it a favored destination for the urban elite. With the country’s major international airport in close proximity through multiple access roads, Tagaytay Highlands is strategically positioned in the middle of emerging tourism hotspots. Access to the property is through four major roads, namely Sta. Rosa Exit (SLEX), Emilio Aguinaldo Highway in Cavite, Batino Exit via Calamba-Tagaytay road and Silangan Exit via Casile road in Laguna. Life and leisure inside Tagaytay Highlands will be a memorable experience since the mountain-resort property boasts two pro golf courses, 11 sports facilities, 15 leisure amenities, and 16 food and beverage outlets. This complements the fact that Tagaytay Highlands’ vacation homes offer upscale amenities that are at par with weekend vacation homes abroad. To top all these, it is conveniently situated near hospitals, academic centers, shopping establishments, hotels and resorts, recreational clubs, industrial and technological parks, churches, banks, and gasoline stations. As far as investing in a prime property goes, it is a premium property with exclusivity and world-class facilities that offer a truly luxurious lifestyle. Tagaytay Highlands is home to different residential communities, each master-planned by reputable design teams and maintained through after-sales and property management. From themed residential lot developments to luxurious condominium communities to authentic log cabin homes, it takes pride in offering a world-class and distinct lifestyle to the most discriminating tastes. Continuing its more than two-decade legacy, the mountain resort is set to take on more innovative steps in the coming years. 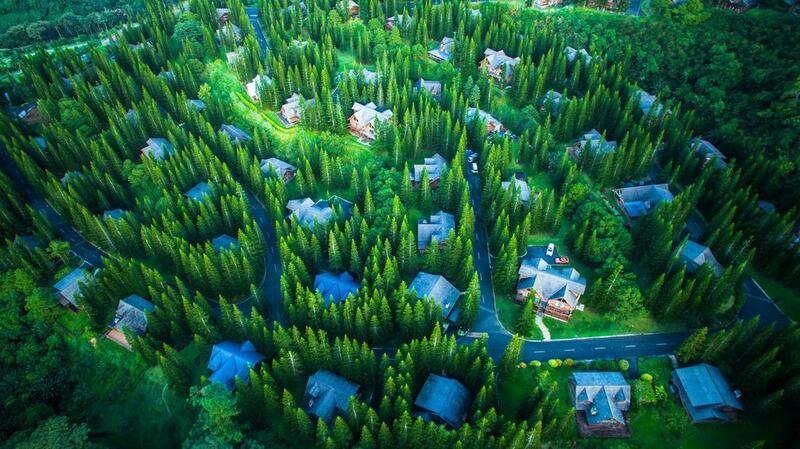 Woodlands Point is a community of charming, contemporary ski resort-inspired log cabins that share the landscape with pine forests and lush mountain ranges. Adding to the authenticity of its mountaintop ambience, Woodlands Point is ideally located on one of the highest elevations in Tagaytay surrounded with the awe-inspiring panoramic views of the Highlands golf course, Laguna de Bay, the Canlubang countryside and the lush, verdant mountains making it a perfect weekend hideaway.